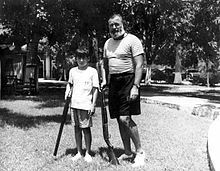 Gregory Hancock Hemingway (November 12, 1931 – October 1, 2001), also known as Gloria Hemingway in later life, was the third and youngest child of author Ernest Hemingway. He became a physician and authored a memoir of life with his father. Born in Kansas City, Missouri, to novelist Ernest Hemingway and his second wife, Pauline Pfeiffer, he was in childhood called Gigi or Gig and was, according to a close observer, "a tremendous athlete" and a "crack shot." As an adult, he preferred the name Greg. Hemingway attended the Canterbury School, a Catholic prep school in Connecticut, graduating in 1949. He dropped out of St. John's College, Annapolis, after one year  and worked for a time as an aircraft mechanic  before moving to California in 1951. Greg Hemingway retreated to Africa, where he drank alcohol and shot elephants. He spent the next three years in Africa as an apprentice professional hunter but failed to obtain a license because of his drinking. He joined and left the U.S. Army in the 1950s, suffered from mental illness, was institutionalized for a time, and received several dozen treatments with electroconvulsive therapy. Of another period shooting elephants he wrote: "I went back to Africa to do more killing. Somehow it was therapeutic." It wasn't until nearly a decade later, in 1960, that he felt strong enough to resume his medical studies and respond to his father's charges. He wrote his father a bitter letter, detailing the medical facts of his mother's death and blaming Ernest for the tragedy. The next year, Ernest Hemingway killed himself, and again Greg wrestled with guilt over the death of a parent. Ernest and Gregory shooting live pigeons at the Club de Cazadores in Cuba. The photo is not dated but Gregory's apparent age and Hemingway's beard (worn mid-1942–1945) suggests early 1940s, probably 1943. The smallest boy was fair and was built like a pocket battle-ship. He was a Copy of Thomas Hudson, physically, reduced in scale and widened and shortened. His skin freckled when it tanned and he had a humorous face and was born being very old. He was a devil too, and deviled both his older brothers, and he had a dark side to him that nobody except Thomas Hudson could ever understand. Neither of them thought about this except that they recognized it in each other and knew it was bad and the man respected it and understood the boy's having it. They were very close to each other although Thomas Hudson had never been as much with this boy as with the others. This youngest boy, Andrew, was a precocious excellent athlete and he had been marvelous with horses since he had first ridden. The other boys were very proud of him but they did not want any nonsense from him, either. He was a little unbelievable and anyone could well have doubted his feats except that many people had seen him ride and watched him jump and seen his cold, professional modesty. He was a boy born to be quite wicked who was being very good and he carried his wickedness around with him transmuted into a sort of teasing gaiety. But he was a bad boy and the others knew it and he knew it. He was just being good while his badness grew inside him. All his life Greg fought a losing battle against this crippling illness. He lacked critical early help because his parents were unable or unwilling to accept his condition nor could he come to terms with it himself for a long time, taking up the study of medicine in the hope that he would find a cure, or at least a solace. Failing that, he developed an alternate persona, a character into which he could retreat from the unbearable responsibilities of being, among other things, his father's son, and of never ever measuring up to what was expected of him, or to what he expected of himself. In most obituaries, he was called Gregory, but Time magazine published a brief notice of the death of "Gloria Hemingway, 69, transsexual youngest son turned daughter of novelist Ernest Hemingway" and noted the novelist once said Gregory had "the biggest dark side in the family except me." The gravestone reads: "Dr. Gregory Hancock Hemingway 1931–2001". He is buried next to his father and half-brother Jack in the Ketchum, Idaho cemetery. Daughter Lorian Hemingway wrote about her father in the 1999 book Walk on Water: A Memoir. Son Edward, an artist, has written and illustrated the children's books Bump in the Night, and "Bad Apple". Son John wrote the critically acclaimed memoir Strange Tribe: A Family Memoir. Son Patrick is a professional photographer based in Vancouver, British Columbia, Canada. Son Seán is the curator of Greek and Roman Art at the Metropolitan Museum of Art in New York City. ^ a b New York Times: Joshua Robinson, "Memories of Playing on Papa Hemingway’s Ball Field ," October 6, 2008, accessed June 27, 2011. Valerie Danby-Smith published a memoir, Running with the Bulls: My Years with the Hemingways, in 2008 under the name Valerie Hemingway. ^ a b c d e f g The Independent: "Gregory Hemingway," October 10, 2001, accessed February 8, 2015. 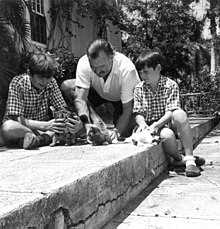 ^ Gregory H. Hemingway, Papa, 119. Collections of Ernest Hemingway's quotations often combine the two statements into one. ^ a b BBC News. 3 October 2003. " Hemingway legacy feud 'resolved'". Accessed 27 May 2007. ^ Valerie Hemingway, "Running with the Bulls," 2005. Wikimedia Commons has media related to Gregory Hemingway.